An original spin-off novel set in the popular Star Trek: The Next Generation universe from New York Times bestselling author James Swallow! In the wake of political upheaval across the United Federation of Planets, Admiral William Riker and the crew of the U.S.S. Titan find themselves in uncertain waters as roles aboard the ship change to reflect a new mandate and a new mission. 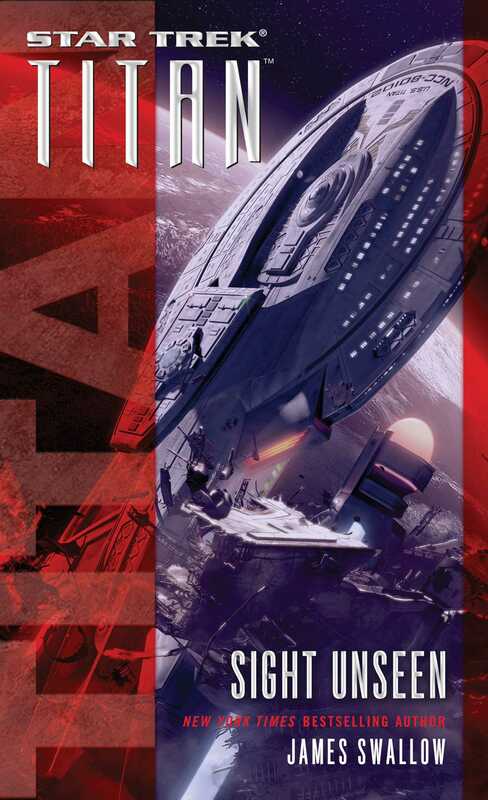 On orders from Starfleet, Titan sets out toward the edge of Federation space to tackle its latest assignment: to work with an alien species known as the Dinac, who are taking their first steps into the galaxy at large as a newly warp-capable civilization. But when disaster befalls the Dinac, the Titan crew discovers they have unknowingly drawn the attention of a deadly, merciless enemy—a nightmare from Riker’s past lurking in the darkness. Friendships will be tested to the limit as familiar faces and new allies must risk everything in a fight against an unstoppable invader—or a horrific threat will be unleashed on the galaxy! It wasn’t the first time on this assignment that he had felt like he was out of his depth. The plain fact of the matter was, the alien starship was like nothing he had ever seen before. Recruited right out of the Tech Clutch on Selay, Ythiss had left his homeworld and clan nests to go to Starfleet Academy, and by the skins of his ancestors, he had graduated with honors. Ythiss liked to think of himself as an intelligent sentient, full of all that fix-anything attitude that Starfleet liked to encourage in its engineers. But this ship didn’t conform to any kind of layout he had ever encountered, not in space or in textbooks. For starters, it seemed to be made largely of wood. “As you wish.” The lieutenant blinked his large slitted eyes and cocked his serpentine head, taking up the slack she offered. A member of the Dinac species, Guoapa was the commander of the vessel, although the duties she performed on her ship would have been the remit of a subordinate engineering officer like Ythiss on a Federation craft. When he had told her that, the canine-like female let out a barking snort of amusement. What kind of fleet gives command to those who don’t have their paws in the engines? With that comment, the Selayan had immediately warmed to the alien captain, and from that point on Guoapa had insisted on having Ythiss as her assigned liaison. She hardly spoke to the lieutenant’s commanding officer back on the U.S.S. Whitetree, much to Captain Minecci’s chagrin, but after a while both the Starfleet and Dinac crews had found a comfortable balance for their association. Ythiss waited for a nod from Guoapa, and they hauled together. The rope snapped taut and his earspots captured the sound of ceramic pulleys turning somewhere up inside the hatch. The lieutenant knew that their actions would—so he hoped—kick off a manual release of the intercooler vanes folded along the outside of the Dinac pinnace. Observed from a distance, Dinac ships had a beauty to them that Ythiss thought quite fetching. Sculpted to be warp-streamlined, they sported gossamer energy-collector wings that reminded him of the great rainmoths that swarmed in the cooler months on Selay. He hauled and did as he was told, but Ythiss was still bothered by the fact that the Whitetree had spent nearly a month with the Dinac and he was no closer to understanding the peculiarities of their faster-than-light drives. It was an odd blend of warp technology that had elements of Gorn brute-force motors, Vok’sha slip-gen engines and certain types of older Romulan systems, all in a mix that was quite unique. Ythiss found them utterly fascinating, to the point that he was spending far too much of his time on board the pinnace trying to fathom them. When the engines had suffered a emergency shutdown, catapulting them from warp velocity in deep space, several light-years away from the Dinac home system, he was actually a little pleased. Not that the ship might be damaged—of course not—but pleased that he would have another excuse to slither around inside the drive core and get an up close and personal look at the alien tech. The Whitetree had quickly come about to take up station alongside and a repair party led by Chief Medeiros was already aboard, shoring up environmental control on the lower decks. Aside from a few bumps and bruises reported by Doctor Shull, the only thing injured so far was Dinac pride. Heavy gears clanked into place and locked, and Guoapa gave Ythiss the bob-of-the-head gesture that was her equivalent of a thank you. The Federation’s cultural survey notes on the Dinac had made it clear that the aliens were a proud species but a practical one. They had not come looking for Starfleet’s help, but they had willingly accepted when it was offered. Ythiss let go of the rope and sucked in a breath. He felt more tired by the exertion than he wanted to admit; over the past few nights, the Selayan had found it difficult to rest, and he put it down to his mind being overly focused on the alien warp drive system. The surveys said the Dinac most closely resembled a bipedal version of a Terran animal known as a fox, with short fur covering almost their entire bodies, tall triangular ears and large eyes above a pointed snout lined with small sharp teeth. Ythiss sometimes despaired of the inevitable comparisons between xeno races and fauna-forms from Earth, a direct result of the fact that a disproportionate number of Federation exobiologists were Terran-born humans. He was from a race that was most often described as cobra-like, although he had seen one of those snakes at a nature reserve on Benecia Colony and been vaguely insulted by the comparison. However you wanted to describe them, the Dinac were a vital people with a bold spirit that Ythiss found invigorating. They were new to the galactic stage, despite having developed a more or less reliable form of interstellar propulsion decades earlier. Until recently, they had been content to remain within the bounds of their home system, but now their government had expressed the wish to become an associate member of the United Federation of Planets. As part of the first steps down that road, the Whitetree had been assigned to the Dinac as part of a technological and cultural exchange. For their part, Starfleet was not only helping to forge an alliance with a new species, but also getting a valuable opportunity for teaching into the bargain. The Whitetree was a small Saber-class starship seconded to Starfleet Academy and the majority of her crew were midshipmen on their first cadet cruise. The Dinac mission was the ideal opportunity to expose the next generation of Starfleet officers to the kind of challenges—and wonders—they would meet after graduation. For a moment, Ythiss recalled his own cadet cruise, and his mind wandered back to what seemed like an epoch long past. So much had happened since then. The Borg Invasion, his experiences serving aboard the U.S.S. Titan, the rise of the Typhon Pact and, most recently, the fallout from the assassination of Federation President Nanietta Bacco. Months later, with a new leader and a new sense of purpose in the UFP, Starfleet had renewed its commitment to exploration, and once his tour on the Whitetree was up, Ythiss hoped to return to the forefront of that endeavor. But he also understood the importance of showing the cadets that Starfleet’s core strength was in its willingness to explore and make new allies, not just to exist as a defensive force. However, none of that would happen if they couldn’t get the pinnace under way again. Guoapa was speaking into a microphone tube sewn into the collar of the multi-pocketed utility waistcoat she wore. Untranslated, the Dinac language sounded like a collection of high-pitched yaps and howls, but the tone was plain enough for Ythiss to surmise that she was giving someone orders. In response, the wooden deck beneath them gave a shudder and the craft lurched as the engines failed to start correctly. Guoapa’s teeth bared in annoyance. The engineer-commander never got to complete her thought. All at once, braying alarms sounded down the length of the tubular wooden corridor, and Ythiss’s nasal slits twitched as he detected the release of an alert scent into the pinnace’s atmosphere. In the same instant, crimson warning flags unfurled across the tricorder’s compact display screen as the energy readings peaked alarmingly. The sensor relay from his ship suddenly cut out. A garbled mess of noise answered him, barely recognizable as a voice. Unable to pick out any words, he sprinted the short distance to a porthole and pressed his face to the glass. As he was an inherently exothermic life-form, the temperature differential of the fluid in Ythiss’s veins was negligible; but still he instinctively recalled a human aphorism about the figurative chilling of one’s blood when he saw what was happening to the Whitetree. The spade-shaped ship was falling. Out in the silent darkness, space itself had ripped open, a great wound in the void bleeding streamers of bright, violent energy. As a warp engineer, Ythiss was dreadfully familiar with the bestiary of spatial anomalies and unpleasant stellar phenomena that could affect faster-than-light vessels. The highly trained, calm and collected part of his mind registered that this was most likely a type-gamma subspace rift, of at least Magnitude Seven on the Ros-Sina-Michael Scale. The rest of his thoughts crystallized into a single, unspoken cry: My friends, my crewmates are on that ship. The first of many gravity distortions radiating out from the rift struck the Dinac pinnace, and Ythiss felt the vessel shake and roll. He tried to pull himself away from the porthole, but he could not tear his gaze from the unfolding horror. The Whitetree’s engines were surging, the glow from the impulse grids flaring brightly as the ship tried and failed to escape the savage pull of the newborn singularity. Lashes made of light whipped the outer hull of the ship and left ugly tears in their wake as compartments underwent catastrophic depressurization. Slowly, agonizingly, the Starfleet vessel began to slide back toward the raging maw of the rift. Behind him, he could hear Guoapa shouting commands, and where his claws touched the wall of the pinnace he could feel the vibrations as the Dinac ship failed over and over to activate its own drives and flee. Meter by meter, the Whitetree was swallowed whole by the ragged mouth of the spatial fissure, consumed along with a handful of escape pods that had ejected in hopes of breaking free of the pull. Fountains of exotic particles briefly flared into the visible spectrum, marking the instant of the Whitetree’s disappearance. The distortion waves kept on coming, pounding the pinnace’s hull like storm-force breakers against a seawall. Wood groaned like a living thing and overstressed supports burst into sprays of splinters. Ythiss felt the craft lurch again as it too now began the slow, inexorable drift toward the rift’s event horizon. He was still trying to form a reply when the anomaly gave a final pulse of energy, before it swallowed itself and vanished. A heartbeat later, a last aftershock ripple of stressed gravitons pulsed out across the darkness and struck the pinnace head-on. The wooden deck came flashing up to meet Ythiss, and then there was pain, then nothing. When he awoke, it was dark and wintry, and the lieutenant had no way to reckon how much time had elapsed. The tricorder was damaged, many of the sensing functions ruined by the subspace discharge or from the sheer physical damage of being hurled across the interior of the Dinac ship. Ythiss was dimly aware that he had broken some bones in his leg, but the pinnace’s internal gravity had dropped, and that made it easier to manage the injury. Guoapa found him as he came out of unconsciousness, and he realized she had moved him to a different compartment. Other Dinac crew members and a couple of familiar faces from the Whitetree huddled there, keeping close together to make the best use of body heat. Breath formed bubbles of white vapor as he exhaled. The air was polar-cold, raking at the inside of his chest like knives. The deep chill made him sluggish, and Ythiss cursed his saurian biology. He nodded again. “That effect we witnessed. It was . . . external. Caused by something outside . . . both ships.” His thoughts were slow and glacial, and Ythiss’s scaly face twisted in a scowl. Ythiss shook his head. “No. I think . . . we were in the wrong place. At the wrong time.” He shuddered at his own understatement. Such bland words to be the epitaph for nearly one hundred officers, noncoms and cadets. A sickly feeling washed over him as he came to the realization that he and the handful of survivors around him would soon join the lost. Either the air would run out or the cold would take their lives. Here, far between stars at the unexplored fringes of the Alpha Quadrant, rescue would never come. The scan returned odd, off-kilter results. Not carbon-based life. Some strain of organic the damaged device cannot read. He tapped another key, activating an overlay. There were no resonance traces from transporters, nothing to indicate another vessel out in the vacuum nearby. If we have been boarded, where did they come from? In the corridor outside the compartment, ice-rimed wood creaked and groaned as weight settled on it. Someone was moving closer. On the other side of the hatch, something made a sharp, metallic noise like the snapping of bones. “I hadn’t noticed,” Riker deadpanned. The reality of it was, the towering Capellan admiral had an entire Starfleet to run, with hundreds of vessels to oversee, the borders of an interstellar nation to patrol and a far frontier to explore. The concerns of one man—and one command—were probably quite a way down his priority list. Still, Will Riker had hoped that ascending to the first rung of the admiralty would have made a difference—but he quickly learned that even within Starfleet’s top brass, the pecking order was as rigidly enforced as it had been between the first class and fourth class on his first day at the Academy, if not more so. He smiled again as he thought of a favorite phrase of his old friend and former commander Jean-Luc Picard: Plus ça change . . . The corridor they followed described a circular arc around the interior wall of Starbase One, the great spindle-shaped space station orbiting high over Earth. As they continued, the bland walls gave way to a vertiginous view through great floor-to-ceiling panels of transparent aluminum. The massive space-bay of the dock extended away beyond the windows, and floating out there in null gravity were a half-dozen starships of various configurations. Most of them had the pearlescent hulls of Starfleet craft, although Riker glimpsed part of a streamlined fuselage in terra cotta shades. Ssura noticed his attention. “From the Vulcan trade delegation,” explained the felinoid. Riker nodded, mentally ticking off all the classes and registrations of the ships with the same care he had shown as a boy growing up in Alaska. Back then he had been poring over pages in the Starship Spotter guidebook; now he had a vessel of his own, although the Titan was elsewhere, at Utopia Planatia over Mars. Still, a little of that thrill he had felt in his youth came back to him as he watched the ships at anchor. Each one was a story waiting to be told, the beginning of a voyage as yet uncharted. And that was why he was here: to get his own story back on track. A turbolift took them down a few levels to the secondary docking ring and a maintenance gallery that protruded from the interior wall of the space-bay. As Riker entered, he saw the sweep of an oval primary hull out past panes of projected holographics. A large cruiser-scale ship was docked there, an older New Orleans-class vessel, and he could see workbees and shuttlepods floating over the hull, making final precruise preparations. Riker looked away and found Admiral of the Fleet Leonard James Akaar standing like a gray-haired sentinel in the middle of the room. He was addressing two junior officers, quietly enough that Riker could not hear what was being said. One of them seemed familiar to him, a dark-haired Efrosian woman with commander’s pips on her collar, but he couldn’t place the face. At her side, a male lieutenant wearing the mustard-yellow undershirt of an operations officer chanced a look in his direction and gave a wary but respectful nod. The younger man was unknown to him, and Riker couldn’t immediately identify his species either. Humanoid, but sporting vertical lines of scales on his forehead, earlobes and throat. Riker made a mental note to question Ssura later on the two officers; as an aide-de-camp, the lieutenant’s precise and fastidious demeanor had its advantages. The Caitian was almost as good as a library computer. “Sir.” Riker fell in step with the taller officer, unconsciously straightening the uniform tunic he wore with a tug on the hem. Akaar led him out of the maintenance gallery and on to a catwalk tube that extended for a good distance over the saucer section of the docked starship below. If not for the tripolymer support struts holding clear panels in place about them, Riker could have imagined they were in the open air high above the hull, like ancient mariners atop a galleon’s mast. Something in Akaar’s tone made Riker tense. The reason he had pressed for this meeting, the reason he was here now, the reason he had always felt he had been in Starfleet, was to take on just such a mission. For a while, he’d had it, holding the center seat on Titan while the ship pushed back the frontier and went, like the old fleet maxim said, where no one had gone before. But that had fallen away from him in the wake of the events that unfolded after the assassination of President Bacco. Maybe it was some kind of karmic revenge for all the times he had refused promotion to captaincy over the years, but Riker’s elevation to flag rank had come completely out of the blue, and on some level, even after months on the job, he was still trying to process that. Becoming an admiral had been the choice of others—of Akaar and officers like him—and Riker had done his best to make the role fit. He understood that the promotion had been about expediency, about the need for the right man in the right place at the right time. And he had taken on that responsibility, helping to bring the architects of the plot behind Bacco’s murder to justice and pulling the Federation back from a darker, more hawkish path. But it was still hard to make everything connect. In all his plans for his tomorrows, Will Riker had not thought much further than the bridge of the Titan, and the love of his wife, Deanna, and daughter, Natasha. Even now there were moments when he looked at himself in the mirror and half-wondered when this would all come to a halt. Okay, Riker. Joke’s over. Give back the rank tabs. “Sir . . .” Riker began. Riker suppressed the desire to wince at the mention of the mission to the disputed planet. Dealing with the manipulative, antagonistic beings on that world had tested his patience almost to the breaking point. Riker colored slightly. What some barrack-room wags had nicknamed the “Takedown Incident” had not exactly been a walk in the park for the newly minted admiral. Along with officers of similar rank from a handful of other galactic powers, Riker had been coerced by elements within an ancient alien civilization to wreak havoc across a dozen star systems, and the fact that he had been used as a proxy against his will was still raw, still a source of both anger and embarrassment. It was another reason Riker wanted to get back out there, to brush off the stigma and return to where he could do the most good. “You’re recalling all the Luna-class ships?” Riker frowned. Riker held back a question. He had heard rumors of a change rippling across Starfleet over the past few weeks. Some were saying it was because of the undue influence exercised over the force from the president pro tem after the Bacco assassination. Ishan Anjar, the ambitious Bajoran politician who had stepped into Bacco’s shoes after the assassination on Deep Space 9, had been a key player in the very conspiracy that brought about her brutal murder. He had justified it with old, familiar rhetoric, cloaking self-aggrandizement with patriotism, claiming that Bacco’s peaceful policies would ultimately weaken and destroy the United Federation of Planets. Even though he was now in prison, Ishan’s influence still persisted in some corners. So Akaar’s putting our house in order, thought Riker. “Just so. You have proven time and time again that you can not only do your duty, but that you also think outside the box. It’s a trait you’ve passed on to all your people on the Titan. And that is why I need you, and that ship, close at hand.” His tone softened slightly. “But perhaps we’ll ease back on the diplomatic missions for now. I have something else in mind.” Akaar’s hand disappeared into a pocket of his long uniform tunic, and it returned with a small padd. He offered it to Riker. “Aye-aye, sir.” Sensing that he was being dismissed, Riker turned to walk back down the gantry, but Akaar put out a hand to halt him. It was then that the missing pieces of information Riker had reached for moments before now came to him. First, that the species the young lieutenant belonged to was a race called the Skagarans, beings who shared a world called North Star with a colony of displaced humans. And second, that the woman with commander’s rank was Dalit Sarai, a former Starfleet Intelligence officer who had directly aligned herself with Ishan Anjar’s aggressive policies . . . and become a pariah because of it.